Single sided conductive aluminium SEM tapes for SEM / FIB applications. 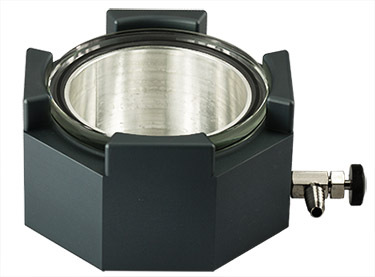 Indispensable for establishing ground contacts between the sample surface and SEM stub or SEM sample holder. The aluminium SEM tape is an alternative to the copper conductive SEM tape when copper can't be tolerated. The tape is made with soft aluminium foil which is easily molded to follow the shape of the sample. Good electrically conductive tape with a conductive pressure sensitive acrylic adhesive. 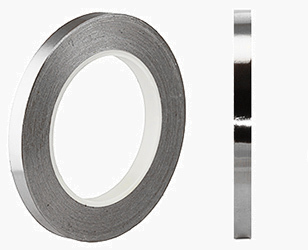 Resistance through adhesive < 4 Ohm and this tape has a high initial tack to provide good conductivity. For long term contacts, we advise to use the EM-Tec conductive copper tape. Over time, the resistance through the adhesive tends to increase. Available in the practical widths ofof 3, 6, 10, 12 and 20mm with a length of 33m. Conductive side covered with siliconised backing paper. 76mm diameter paper core.